Oh those first days of September, still not much cloudy days but for me it means holiday is officially over. Not in a sad way, because together with my academic year, the cultural season starts this week. While a handful of festivals dance the last shiny afternoons away, I’m moving indoor again for some proper fun. 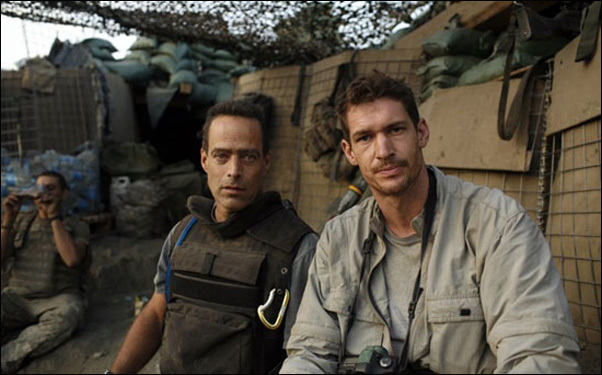 My kick-off will be an inspiring collaboration between FOAM and De Balie, who present you four special film nights around the artist Tim Hetherington. Besides interesting also an easy way to gather some meaningful one-liners about war and politics. So first: Tim who? Mr. Hetherington was a British journalist who filled his days with photograph, especially ones made at the battlefront. In such a good way, that he won the 2007 World Press Photo with a portrait of an American soldier in Afghanistan. Unlike many of his colleagues, he prefers people rather than action in his war images, say less guns and more faces. That’s the reason why if you read about his work, an ‘individualistic approach’ is a common saying about his oeuvre. Tragically, he literally died in the field, by a Libyan bullet in 2011. FOAM pays attention to this story with the first Dutch exhibition and these film evenings. Today you could’ve get know this man and his career better with a documentary about his life. More interested in the bigger picture? Tomorrow Full Battle Rattle shows you an Iraq war simulation in the California desert. Like it closer to home? On Thursday De Uitverkorenen is about the Dutch Marine training (from IDFA 2012). Or curious about the creative qualities of Hetherington? On Friday you can watch Restrepo, his own film. Don’t be afraid for confusion, because every session starts with an introduction. Have a good education. It’s Oscar time at Pathé de Munt and De Balie!